anthonys-vintage-collectables has no other items for sale. 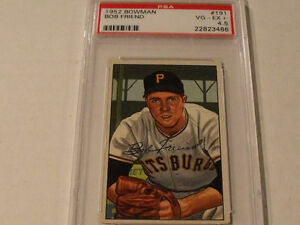 Details about 1952 BOWMAN #191 BOB FRIEND Pittsburgh Pirates -PSA 4.5 VG-EX+ Rare Rookie Card! 1952 BOWMAN #191 BOB FRIEND Pittsburgh Pirates -PSA 4.5 VG-EX+ Rare Rookie Card! $0.50 shipping for each additional eligible item you buy from anthonys-vintage-collectables.